“Schumacher Insists on Quickstep Contract” – Wha??? There was a story on my cell phone today that fell in the category of strange news. York, PA. – Police say a central Pennsylvania man tried to rob a bank – but teller’s empty drawers thwarted the attempt. Springettsbury Township Police Lt. Scott Laird said the teller’s were waiting for their drawers to be filled when a man entered a Susquehanna Bank branch Thursday morning and demanded money. The first teller fainted and the next two showed him the empty drawers. Laird says the robber then threatened to file a complaint with bank management before leaving. Maybe Schumacher was in York – fookin’ moron thinks we are all fools. Hate to tell it to him but the Quickstep drawers are empty. You gotta wonder what size this guy’s brain is. First he comes storming out nowhere to win 2 TdF TT’s and in between be OTF for what seemed like the whole freakin’ race. Gosh he was practically flaunting his obviously doped legs with the wake he was leaving behind. And then have the gall to insist on continuing to work. I just gotta laugh – no team manager is crazy enough to touch this guy with a flagpole. Unless of course he is a Kazakh. Read the strange news on Cyclingnews. 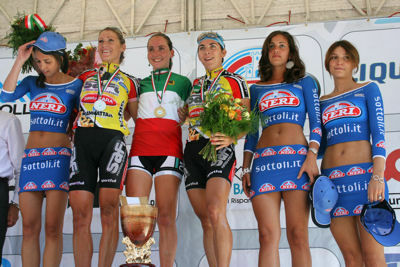 From the 2007 Italian National Championships. So how come the podium girls at the big tours don’t dress like this???? Or for any of the other ‘mens’ races for that matter??? Lance Armstrong teamed up this past Sunday with John Korioth to race the Tour de Gruene two-man team time trial event. John describes his experience as “probably the hardest thing I have ever done on a bike.” The pain paid off as the pair won their division with a time of 56:37 on the 27.3 mile course, which was 2:34 faster than the second place team of David Wenger and Steven Wheeler. John and Lance both raced with an SRM powermeter and John has provided TrainingPeaks with his race file which can be seen and downloaded here. John averaged 340watts and had a normalized power reading of 357watts, which makes you wonder how many watts Lance was pushing given that John rode the majority of the race in Lance’s slipstream. John reflects on his experience racing with Lance in a short interview with TrainingPeaks. TP-How did you feel during the TT? JK- This was probably the hardest thing I have ever done on a bike. Its tough to say I felt good with my HR so high all the time (well above my Lactate Threshold 168hr). I would have thought I would have been able to get some recovery sitting on Lance’s wheel as I do on my road bike when riding behind him. However, once he is fully aero (TT Suit, and helmet) it is very tough to get a good draft off of him and then be able to get any recovery. As you can tell from the file, I think only once during the race did my HR ever get back down below 170 and that wasn’t for long before it was back up to 178. TP-Did the race go as planned? JK- I thought I would have been able to help a little more and make some stronger pulls. When I was called through I was so redlined I tried to go easier just to get some recovery. Lance and I knew one of the keys was going to be communication and with those Aero helmets it is tough to hear so there was a lot of shouting at each other. If you would have heard me you would have thought I was mad at him but that was not the case. I was just trying to tell him to take it easy up the hills and into some turns so he wouldn’t gap me off. TP- How much did you pull versus Lance? JK- I would probably say Lance pulled 75% off the time. I think he could have won all by himself if he wanted to. He is just that strong. He also just has the ability to make the bike go fast. He can get it up on a flat road to 31mph and just hold it there. Its tough to stick behind that for a long time. TP- Did you specifically train for this race? You had a great race. JK- I did train for it, but not like Masters Nationals (John is the current USAC 40-44 National Road race Champion). This wasn’t even on my schedule until about 3 weeks prior. So I had to go get dust off the TT bike and make some adjustments and do what I could. My coach Dave Wenger (who was part of the second place team) from Source Endurance did the best he could but I think it could have been better with more time and some motor pacing. I’ve not been one to stretch before exercise and have always preferred a slow start to warm up so this article certainly affirms my approach.